Gore-Tex boots are getting more and more popular. GORE-TEX® Boots – Are they really worth it? Gore-Tex boots are getting more and more popular. It has got me thinking why is this the case?. So I have done some research on Gore-Tex (sad I know). I was very surprised with the things I have learnt about the boot industry while I was doing this research and also found out how and why Gore-Tex boots are getting very popular. Gore-Tex is a word throw around by many people who don’t understand what it actually is. To a lot of people Gore-Tex just means waterproof. “Get your Gore-Tex jacket on” This is a saying you hear a lot around the military. The problem is half the time the jacket wasn’t actually Gore-Tex. It was just waterproof. It is a bit like the Hoover/Vacuum problem. Hover is a brand and Gore-Tex is a brand. Gore-Tex is one of the most Waterproof fabrics in the world. It is used in many different items of clothing. Gore the company that invented the fabric started off doing electric cables. They now currently do many things from healthcare products to electrical goods. How good is the waterproof fabric? The waterproof fabric that Gore makes stands up as the best for many reasons. The first is actually how waterproof it is. A normal boot that says waterproof (EN ISO 20344) only has to withstand 4800 flexes (80 minutes of walking) and is still allowed to let 3 cm2 of water in the boot. Gore-Tex footwear can withstand up to 300,000 flex movements (80 hours of walking) and does not allow any water in. If you need a waterproof boot go for a gore-tex boot. With the fabric being this waterproof you may think it does not allow your foot to breath but gore-tex have already got you covered. They do a breathabilty test as well. For a brand to use Gore-Tex technology in there boots they have to be able to allow the foot to breath as well. Gore does a test on each boot and it has to be 6 times more breathable than the average. 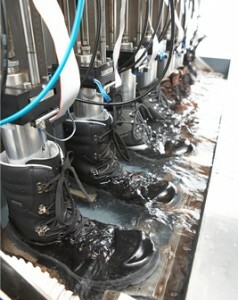 Gore-Tex Testing the breathability on a range of boots. Gore-Tex Waterproof Testing Phase. The boot is kept underwater whilst being flexed in a walking motion. How durable is all this technology? As a boot brand if you want to use the Gore technology you have to pass the above tests but also Gore expects you to use the highest grade materials you can. That means the boots are made with high quality, durable materials. This makes the boots highly durable and make with a fantastic finish. The fabric inside the boots also have to be very durable. 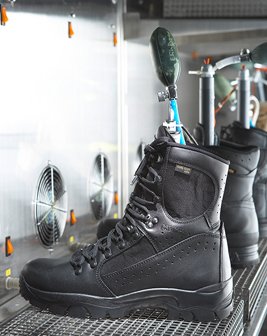 The fabric is able to take up to four more times abrasion movement than normal layers in side a boots. So it it worth it? In short Gore-tex boots are more durable, fully waterproof and breathable than your average boot. I think the answer is clear. If you are looking for a high end quality waterproof boot. Then look for the Gore-tex or GTX sign in the name of the boot. You may have not heard of Kombat UK as they mainly do military kit. They have released the Kombat UK Patrol boots and they are not to be sniffed at. Kombat UK have a wide range kit and normally it is on a very affordable budget. Magnum have come up with a new range called the Magnum Lynx boots. In this post I am going to talk about the Magnum Lynx 6 boot.